My 7 year old son was first overwhelmed by the task at hand (not being an action figure kind of kid) but became pretty psyched when he saw how he could combine the sets into strange looking bots. There was definitely a learning curve involved in figuring out exactly where each piece connected and how make our bot transform–but we worked it out when we stopped trying to look at the directions. My guess is that a kid more familiar with the actual Transformer characters and how they work would have an easier time right off the bat, but my kiddo had fun just the same. From an educational point of view, I could see this product coming in handy as a literacy tool to help a struggling writer name and describe a bot and come up with a back story and continued adventures for the character. Though you won’t be finding this product on a shelf with literacy toys any time soon, it could definitely be used as an educational tool. Hasbro has been nice enough to make a ConstructBot available to me to giveaway as well! For fun, I will be running a flash 24 hour giveaway. This entry was posted in Giveaways, Products, Toys by jessica. Bookmark the permalink. 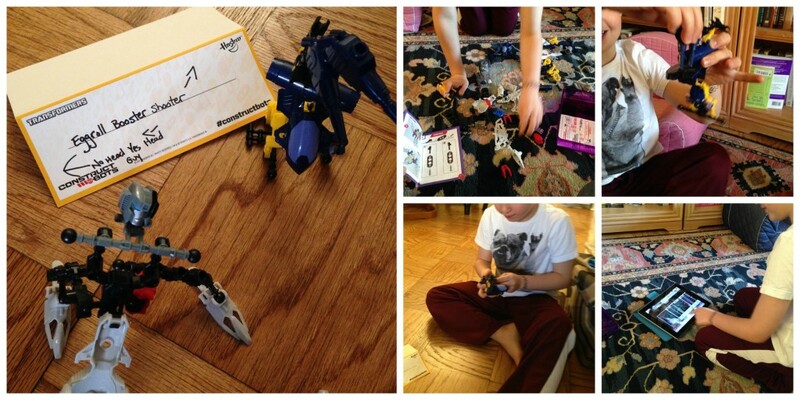 My son has recently become obsessed with Transformers, the ConstructBot looks so cool. Is having such a hard time. It would brighten his world! A tough time it would brighten his world! I would totally give this to my nephew he is into robots right now. I guess being 8 robots become a big part of life haha! Mama bot teehee! I would like to get this for my nephew he loves building stuff! I would give this to my grandson, thanks! I would love to give this gift to my daughter. I am sure she could come up with a great name! Oh, I miss the chance to in…my son would’ve love this. I’ll check if they have it Amazon.